AverLogic, available through Glyn High-Tech Distribution , is now offering its Network Video Server module capable of streaming real-time audio/video over the Internet and enables system designers to quickly develop a Network Video Server or IP Camera by using MPEG-4 technology. It transmits the configurable MPEG-4 compressed video and audio streaming data with TCP/IP protocol through Ethernet, Power line or WiFi to remote receivers. Moreover, the compact size design, 42x42x25mm (LxWxH), makes the integration easily. Jump to Digital is simple to analogue camera manufacturers when integrating this module into their housing. 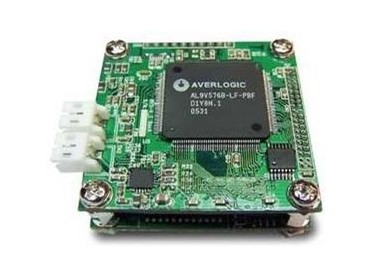 The Network Video Server module accepts NTSC or PAL composite signal input and uses AverLogic’s AL240 video decoder. Audio input is also supported with video and audio compression achieved using AverLogic’s AL9V576B MPEG Encoder. The Network Video Server module uses an ARM9 RISC MUC running on embedded Linux and has a built-in embedded web server which can interface with browsers like IE 6.0 and above.